The City of Destiny has added another feather in its cap by emerging as the third cleanest city in the ‘Swachh Survekshan' survey. 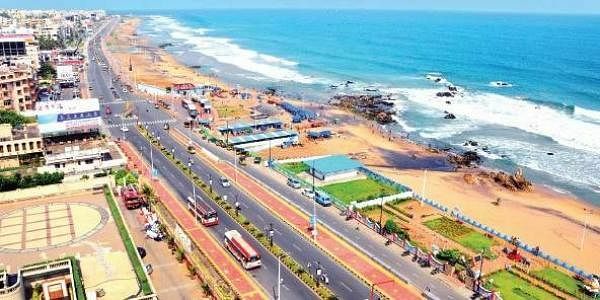 VISAKHAPATNAM: The City of Destiny has added another feather in its cap by emerging as the third cleanest city in the country during the ‘Swachh Survekshan- 2017 survey the results of which were announced by Union urban development minister M Venkaiah Naidu in New Delhi on Thursday. Vizag, which bagged the fifth rank in the first edition of the survey last year, stood third among the 434 cities and towns in India, next to only Indore and Bhopal in Madhya Pradesh this time. Collector Pravin Kumar and Greater Visakhapatnam Municipal Corporation (GVMC) commissioner M Hari Narayanan received the award from Union minister Venkaiah Naidu at a glittering function in New Delhi on Thursday. The Swachh Survekshan -2017 survey was carried out by the Quality Council of India (QCI), which had deployed 421 assessors for an on-the-spot assessment of 17,500 locations in 434 cities and towns in the country. Another 55 people regularly monitored the survey process in real time. To evaluate the cleanliness of the cities, the QCI has mainly concentrated on three major components. The criteria and weightage for different components of sanitation-related aspects used for the survey were : 1) Solid waste management including door-to-door waste collection, processing and disposal, a) ODF (open defecation free) city status. These carried 45 per cent of the total 2,000 marks. 2) Citizen feedback - 30 per cent & 3) Independent observation - 25 per cent. As part of it, the QCI also conducted a third party survey to re-access the efficacy of the cleanliness reports of all the Smart Cities. After completion of all these filtering phases, successful cities were placed in the final ranking list. The GVMC has taken all precautions to collect household waste regularly and fielded more number of workers for sanitation duties. Modern waste dumping bins were provided across the municipal limits and extra care was taken to plant thousands of saplings at all vacant places ensuring clean and green concept implementation at each and every slum area. On the ODF status, GVMC authorities concentrated on more than 100 slum areas in and around the city and tried to bring awareness among the public. As a result, almost all areas were declared ODF. Civic authorities also made efforts to send good citizen feedback through their field network. GVMC-UCD staff and sanitation department teams had gone to field level and created awareness among public on the downloading of ‘Swachh’ mobile app and complaining about the sanitation issues. All these cumulatively worked well to secure good rank. Pravin Kumar and Hari Narayanan expressed happiness on the latest achievement. “The award today is for the City of Visakhapatnam, it is the hard work of all my officers, staff and especially the workers on the field. My sincere thanks and appreciation for each person who has worked for this. The GVMC will work hard to continue to keep Visakhapatnam a clean city. I also place on record my sincere gratitude to the citizens of Port City for their continuous support and appreciation,” Hari Narayanan said.